Steve Collins has spent almost all his adult life facing challenges head on - mainly in the hallowed square ring - from early days as an amateur boxer through to a massively successful professional career, that see him crowned World Champion in two weight divisions, not once but twice, but now the man known as the ‘Celtic Warrior’ has a new challenge, in a new field (no pun intended) as he launches a new extreme running event – THE GREAT BRITISH HELL RUN – and all for a good cause. The event, which takes place at the St Albans Polo Club in Hertfordshire on Saturday 14th June, will be raising funds for the Irish Guards Charitable Fund, Help For Heroes, Royal Hospital Chelsea and Cure Rett, has an entry fee of just £25. Following a video shoot to promote the event, at the TRAD TKO gym in Canning Town, the man that beat both Nigel Benn and Chris Eubank twice spoke of his latest challenge. “I’m really excited by this Great British Hell Run, AKA the GBH Run, it’s similar to the mudders or mud runs that are taking place around the country, but it’s not quite as severe. It’s for all levels of fitness and those taking part can make it as easy or hard as they like, because all the obstacles are optional and you can go over them or around them. 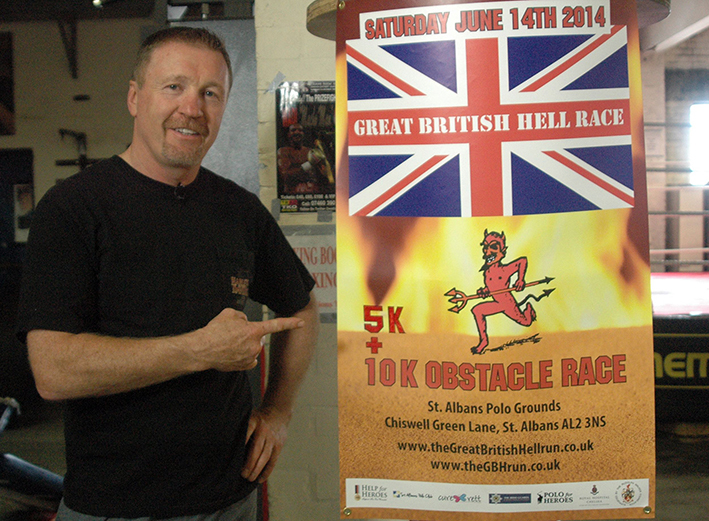 THE GREAT BRITISH HELL RUN starts at 10:30am on Saturday 14th June 2014, at the St Albans Polo Club, Chiswell Green Lane, St Albans, Hertfordshire AL2 3NS, To register (£25) go to www.thegbhrun.co.uk.